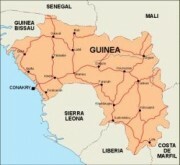 Guinea, officially the Republic of Guinea, is a country in West Africa. Formerly known as French Guinea, it is today sometimes called Guinea-Conakry to distinguish it from its neighbour Guinea-Bissau. 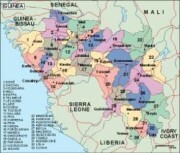 Guinea is divided into eight administrative regions and subdivided into thirty-three prefectures. 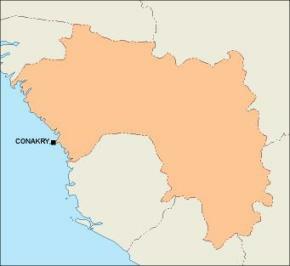 Conakry is the capital, largest city and economic center. 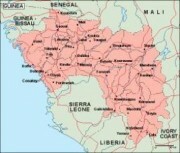 The other major cities in the country include Labe, Nzérékoré, Kankan, Kindia, Mamou, Boke, and Guéckédou. Guinea has almost 246,000 square kilometres. 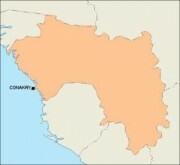 It forms a crescent by curving from its western border on the Atlantic Ocean toward the east and the south. 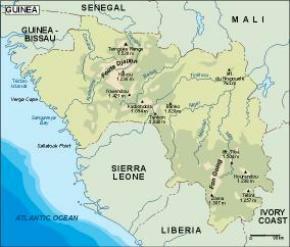 Its northern border is shared with Guinea-Bissau, Senegal, and Mali, the southern one with Sierra Leone, Liberia, and Côte d’Ivoire. 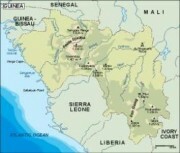 The Niger River arises in Guinea and runs eastward.